On October 8th, Indie Lee and Beautylish held a DIY skincare event, where attendees got to make their own natural skincare products, including a peppermint lip scrub, bergamot & orange bathing salt and lavender body scrub. It was so much fun and easy making my own skincare products and deciding what essential oils to add to the basic ingredients. DIY skincare is great for holiday gifting, so my friends and family shouldn't be surprised if they get a DIY skincare gift from me. 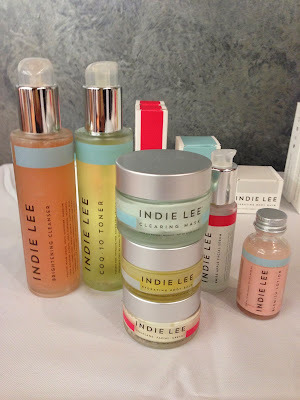 During the event I got to meet with Indie Lee and find out more about her all-natural skincare line, while enjoying mimosas, cupcakes and cake pops. Indie Lee's Coconut Citrus Scrub that was showcased at the event immediately became a favorite of mine. Here are the instructions on how to make your own DIY skincare if you'd like to give it a try. Your local Whole Foods would be the perfect place to find the needed ingredients. - COMBINE salt and carrier oil together with a spoon, fork, or craft stick in bowl or jar; break up clumps by mashing together. - MIX and add essential oils until you've created the perfect heavenly scent for your bath time. Add a few flower buds for some extra fragrance, this adds a pretty touch as well. - USE whenever you want to transform your daily bath into a day at the spa - this also makes the PERFECT hostess gift! - COMBINE salt and carrier oil in a bowl until a delicious texture forms. - MIX in dried lavender and then sprinkle in a drop or two of lavender essential oil. Add drops one at a time so you can decide how strong a scent you want. - USE for at-home pedicures or all over exfoliation - simply scrub the day away in the most luxurious way possible.